2 dynamic, in-depth courses in 1 - Essential reading for the ever-curious in both sciences that are effectively, and thoroughly presented by a proven outreach teaching method – lectures in the field, under the sky, and on the ocean – not in a classroom. The coverage is thorough - check out the table of contents. This is a single-source reference book with entertaining yet thorough discussions on relativity, quantum mechanics, speciation, and natural selection. From the Classic Greek Periods to the present, many key biographies are included to maintain a historical perspective and to see the origins of the many connections between the physical and biological worlds around you, including the Universe or Cosmos – whichever you are more comfortable with. The reader is asked to bring his/ her interest and curiosity; the book will provide the information and inspiration – both will be within easy reach. The Baryon Press announces the release of a new science title, that is a combined, in-depth astronomy/ natural history course. Astronomy & Natural History Connections: From Darwin to Einstein, written by Barry Boyce, is essential reading for the ever-curious in both sciences; the information ranges from entertaining yet thorough discussions on relativity and quantum mechanics as well as dynamic presentations of natural selection and speciation. From the Classic Greek Periods to the present, many key biographies are included to maintain a historical perspective and to see the origins of the many connections between the physical and biological worlds. Examples of this unification i include the importance of the Venus Transit in the history of scientific measurement and the role of Sir Isaac Newton in developing the concept of a testable Scientific Theory. In a section called Natural Connections (all the Chapters have a “Connections” theme), evolution is shown not to be necessarily adaptive, and not at all what Darwin discussed at any length; at the same time, natural selection is indeed adaptive process and the guiding principle that Darwin used (and biology still does). The concept of speciation is shown to quite complex as no traditional definition works for describing what a species is with a high degree of statistical accuracy. The term “species” itself is called into question as, per natural selection, as there is most probably a continuum rather than the discrete stops that taxonomy requires. As Boyce states, somewhat tongue-in-cheek, “seems that Noah would need a bigger Ark and have to take us all”. The book does have its entertaining moments. Further, natural selection has been observed to quite often be a relatively fast process, citing the Stephen Jay Gould concept of punctuated equilibrium. Finally, migration is also viewed as complex and basically as an effective breeding strategy, but not the only one. In the world of astronomy and astrophysics, the physical-chemical mechanism of nucleosynthesis is thoroughly presented, in a fashion that the layperson can follow; an interesting theme here is hydrodynamic equilibrium, the balancing of gravity and pressure, allowing for stars to produce light for up to billions of years. The difficult to fathom subject of electron degeneracy is introduced, a bit light-heartedly, as a tie-in to quantum mechanics. While we “are all made of starstuff”, no element heavier than iron is formed during nucleosynthesis, as these “heavy metals” are exothermic (requiring rather than producing energy); for their manufacture, the explosive heat of a supernova is necessary. Stellar evolution is discussed somewhat uniquely as a process that combines much of what we know - from birth inside a stellar nursery to a star’s final days . . . depending on its mass, as a red giant, white dwarf, planetary nebula, neutron star or black hole. For the discovery of the expansion of the Universe, Vesto Slipher is given equal billing to Edwin Hubble, and the man of the hour as far as the Big Bang (and the “cosmic egg”) is concerned, is the Belgian Jesuit Priest, Georges Lemaître. As we look towards the future, the pros and cons of colonizing/ terraforming Mars is given a thorough discussion. Other topics of the future include manned vs. robotic space missions, the next generation of telescopes, genetic switches, a possibly imminent magnetic pole reversal, the search for life in the Universe, Exoplanets, Dark Matter & Dark Energy. Barry Boyce was a graduate student in the neurosciences. He has over 30 years teaching natural history and astronomy on and outreach basis on expedition voyages to the Galápagos Islands and the Antarctic; this book is an orderly presentation of the best of these moments. He currently teaches outreach astronomy for the University of Arizona at their Mt. Lemmon Sky Center. He is also an astrophotographer and nature photographer; his images can be seen on www.barryboyce.com . He is the author of A Traveler’s Guide to the Galápagos Islands. 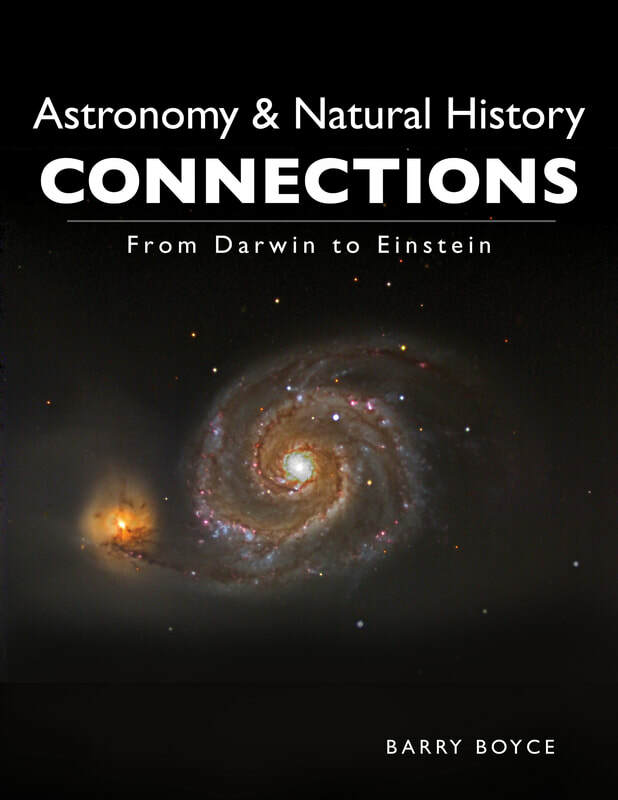 Astronomy & Natural History Connections: From Darwin to Einstein - 300 pages, 25 full-color images (many of which are astrophotography images) all taken by the author - available as an e-book in all formats.